Hours: 10:00 a.m. – 6:00 p.m.
Trainers train people. Coaches change people. Like it or not, you are a coach. Whether you are a trainer, therapist, teacher, parent, athlete, co-worker or boss, you’re a coach too. Throughout your day, you are given constant opportunities to either coach someone up or down. If you want to improve your technical and tactical skills as a coach and impact more people, you do not want to miss this opportunity to train live with Martin Rooney in Kuwait on Saturday, October 26, 2019. Being called a coach Saturday a tremendous amount of responsibility. So many people are looking for guidance, motivation and someone to believe in them at times when they believe in themselves the least. Simply put, the world wants and needs more great coaches. Although there are numerous skills of a coach that are essential, there is rarely much time spent educating coaches in those areas. This 6-hour coaching event with world-renown coach, Martin Rooney will fill that void and make you a better coach. During the event, Martin will share the knowledge he has gained coaching athletes and trainers around the world. Martin’s 20-year coaching experience spans from training young children to Professional athletes, as well as military organizations and Fortune 500 company leaders. At Coaching Greatness, you will learn a coach’s job is to take someone from where they are to where they want to go. The way for a coach to do this is to create a transformation in that person. This transformation occurs when a coach is there to inspire and instill confidence in his or her players in order to do his or her most important job: to believe in these players even when they don’t even believe in themselves. At Coaching Greatness, Martin will teach you to improve areas like your enthusiasm, empathy, leadership, goal setting, and engagement in order for you to improve the lives of others. If you deal with people on a daily basis, you are a coach. The most successful coaches in any industry are the ones that have the ability to make someone more than before the time met them. 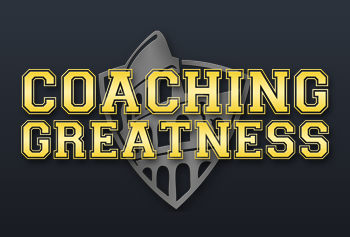 Coaching Greatness will be the day to make you one of those coaches. Join Martin for a unique experience that you will not forget!